Agriculture Minister Uri Ariel says State has offered housing solutions to Bedouin in illegal villages, but they have refused all offers. 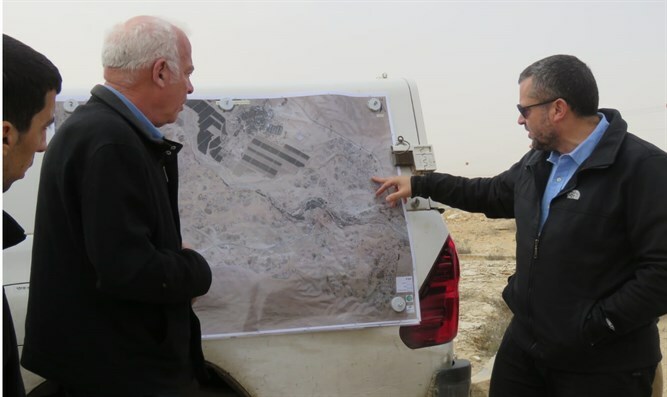 Agriculture Minister Uri Ariel, head of the Negev Bedouin Development and Settlement Authority, met Sunday with the committee of the illegal Bedouin village Bir Hadaj and toured the ruins there. The tour is part of the demolition of the illegal buildings of the local residents after years of attempts to arrange a legal solution to the issue. During the meeting, Minister Ariel rejected the remarks of the Bir Hadaj Committee. "We will continue to show zero tolerance for illegal construction in the Negev. You have territories, we offered you options, and it makes no sense that you will continue to take over land and build illegal construction." Last night, Minister Ariel said that "the state has already offered them far-reaching proposals in previous years, and they rejected all the proposals. The State of Israel will grant equal rights to Bedouin citizens like any other citizen, but they will not be above the law. " The illegal village of Bir Hadaj began in 1994, when they seized state lands in the Negev between Kibbutz Revivim and the Mishlat Mashavim Nature Reserve. The dispersion began with the invasion of the 15 families of Abu Ghardud from the Azzma tribe to State land near Kibbutz Mashavim. After discussions about the future of the family, the state decided to transfer them temporarily to the area next to Kibbutz Revivim. Since the crossing, more than 300 families from the Azzma tribe and the Janaviy tribe have invaded the Bir Hadaj area and have taken over 20,000 dunams (about 5,000 acres), and since then the invasion has continued and today over 7,000 people live there. In the early 2000s, a government decision was made to arrange the village for a permanent settlement. A planning process was initiated, in cooperation and coordination with the rsidents, a plan was prepared and a blue line was drawn, with an area of ​​6,500 dunams (1,600 acres). However, the attempts to organize did not bear fruit as there were hardly any residents who responded to the proposal. Following the residents' decision not to accept an agreement, the conditions that benefit the residents of Bir Hadaj have been canceled and they are entitled, like the rest of the Bedouin, to a half dunam plot or a plot of one and a half dunams for two families.